Wait, it’s been over a month? I’ve been… uh, busy (lazy). Here’s a toy! So, if you saw the new Venom movie, you probably noticed Woody Harrelson in a ridiculous red wig at the end (uh, spoilers?). 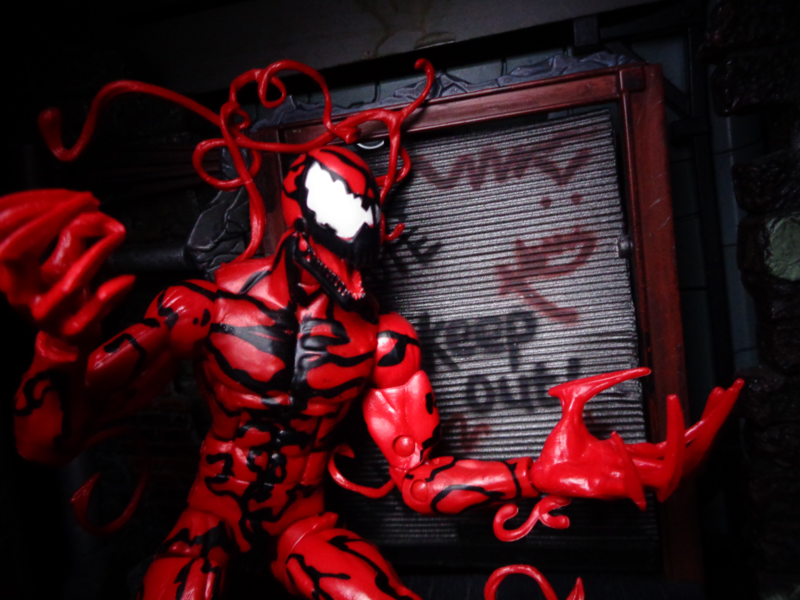 Cletus Kasady, aka Carnage, was invented in the comics when Venom stopped being as much of a bad guy, and he has lived on since as a complete, utter psychopath in the Marvel universe. You can look up his lengthy comics history if you want, but just think of him in those terms, and you’ve got it. He changes his limbs into blades like the T-1000, has a chin like The Joker, and kills people for the sake of wrecking with a comic’s rating. X-Treeeeeeme. I mean, I like the character’s design, but I’ll admit he hasn’t always been used well over the years. The thing about this figure is, it’s almost completely made of reused parts. The base figure already exists in virtually the same paint scheme, and his accessories aren’t all new. But you see… some of them are! 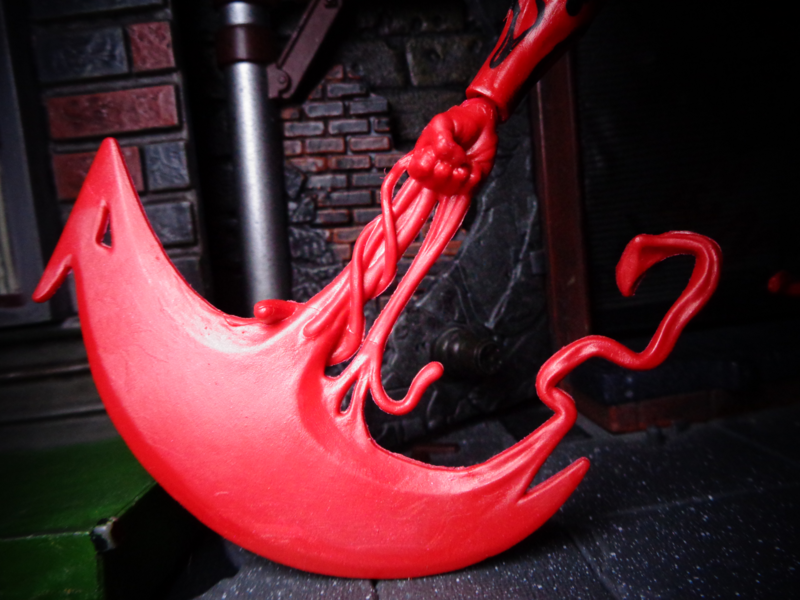 The giant axe hand, for example. 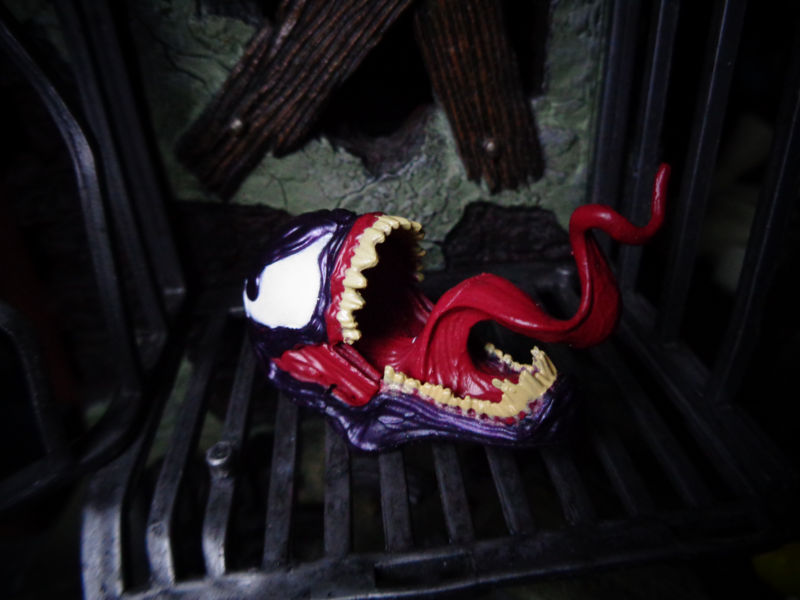 The back tentacles are from one of the previous releases of this sculpt, but not all of them – so, sort of new? Maybe. 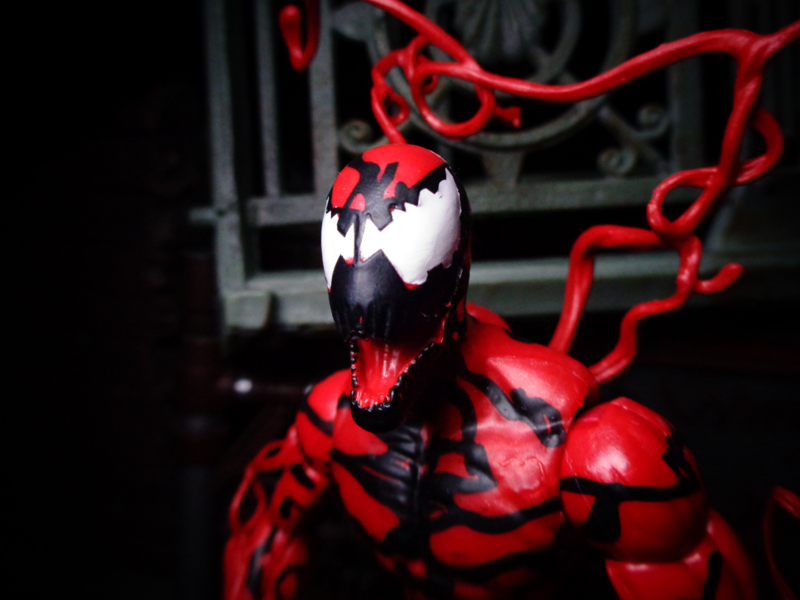 Carnage’s face is the kind of art that’s really hard to render in 3D. And yet the toy does a surprisingly good job handling it. one of the unique things about him was that he looked like a drawing, with those flat colors and jagged lines. But this works. 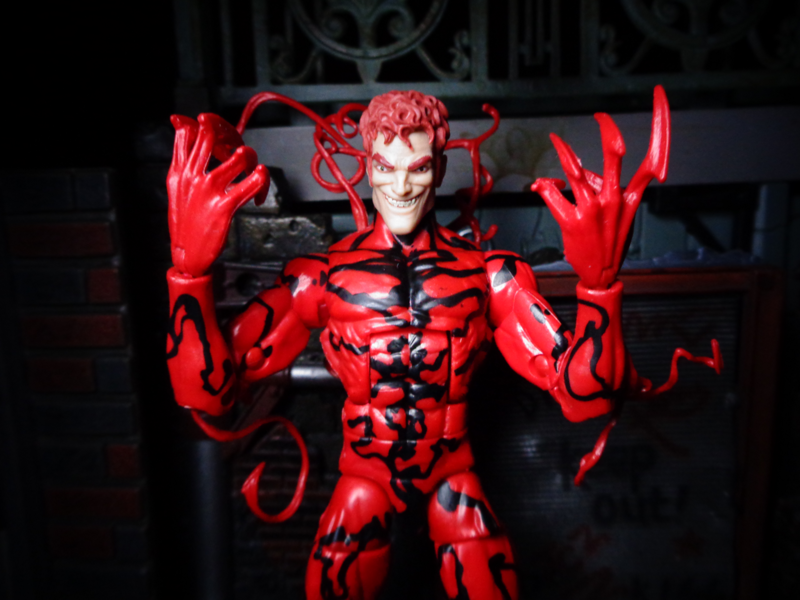 The alternate head (which may be new) shows Kasady in all his glory. And to be honest, he was originally drawn as The Joker. Seriously, the artists just copied the Batman villain and let the colorists change him. Seriously. He hasn’t remained a ripoff forever, but you can see that influence. 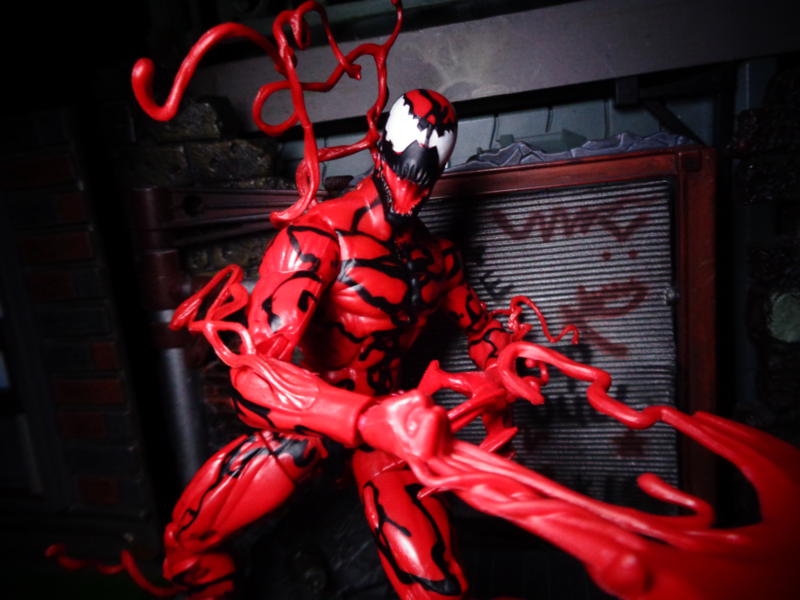 The axe hand is one of his favorite morphed weapons, and if you’ve ever played that Maximum Carnage game, you probably have (un)fond memories about being wrecked by them. 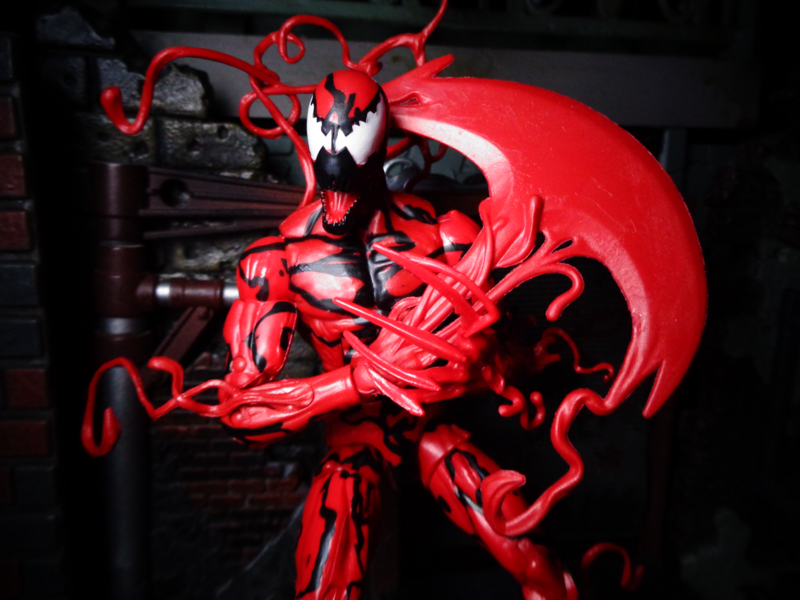 you know, everything about Carnage’s appearance takes advantage of the 2D inked medium, and it’s impressive how the toy can portray all those streaming tentacle bits. 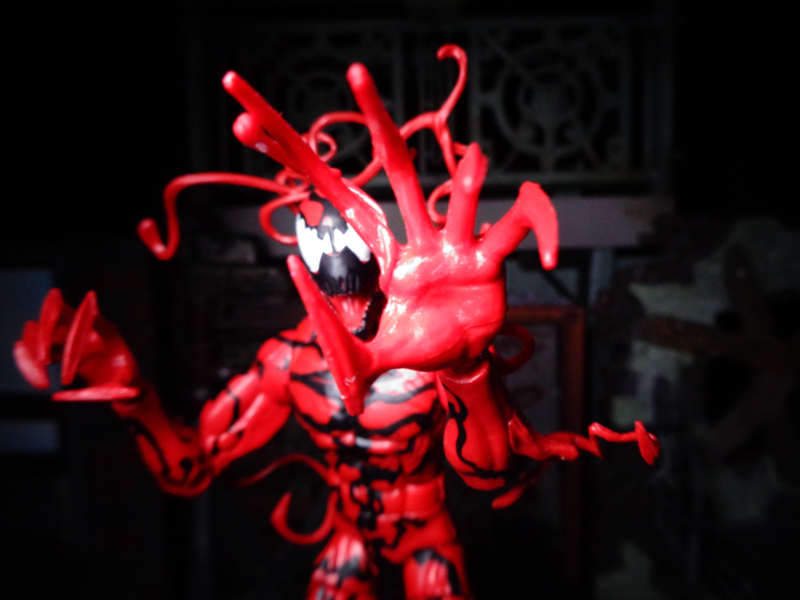 Carnage also comes with one marginally larger hand. It’s… it’s cool and all, but not very different than the other. 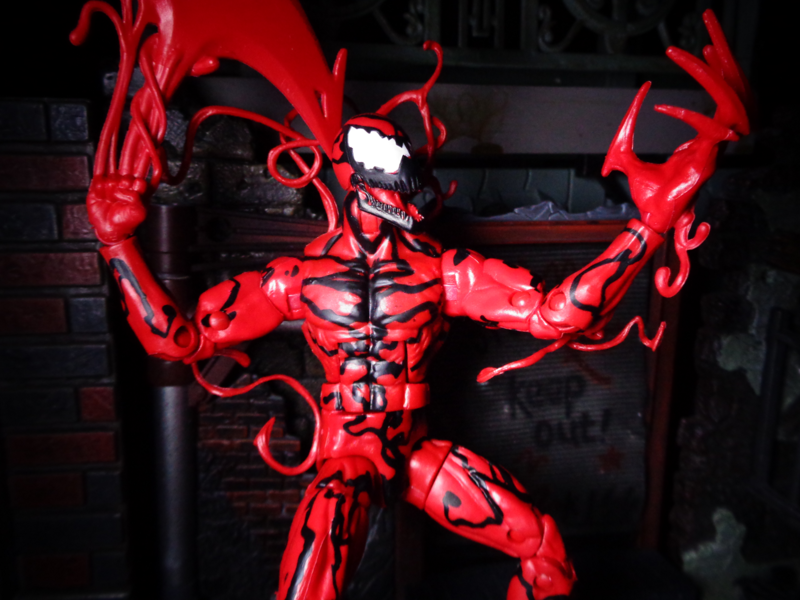 I didn’t mention Scream’s BAF part (an arm), but Carnage comes with Venom’s head, which is a great piece all on its own! 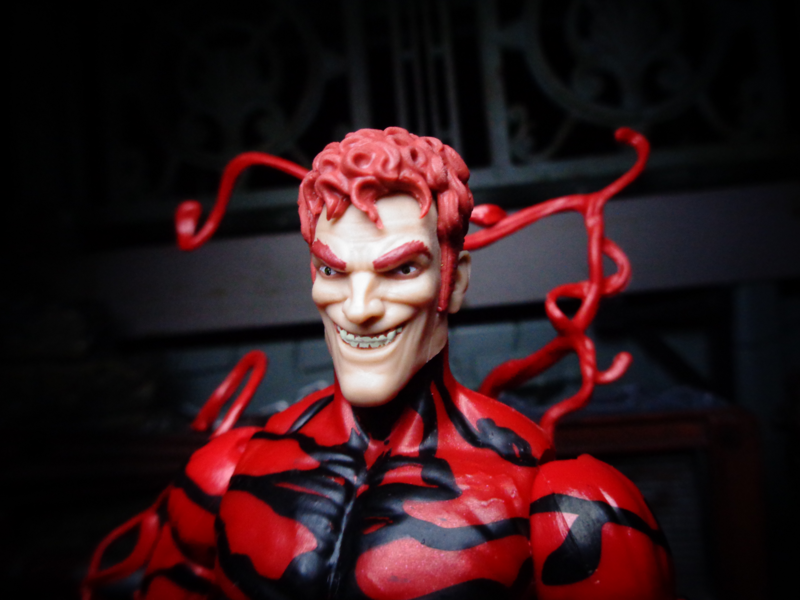 Since the figure is mostly just a reprint, it’s probably better to look at it if you don’t have the original. On its own merits, it brings a lot to the table. 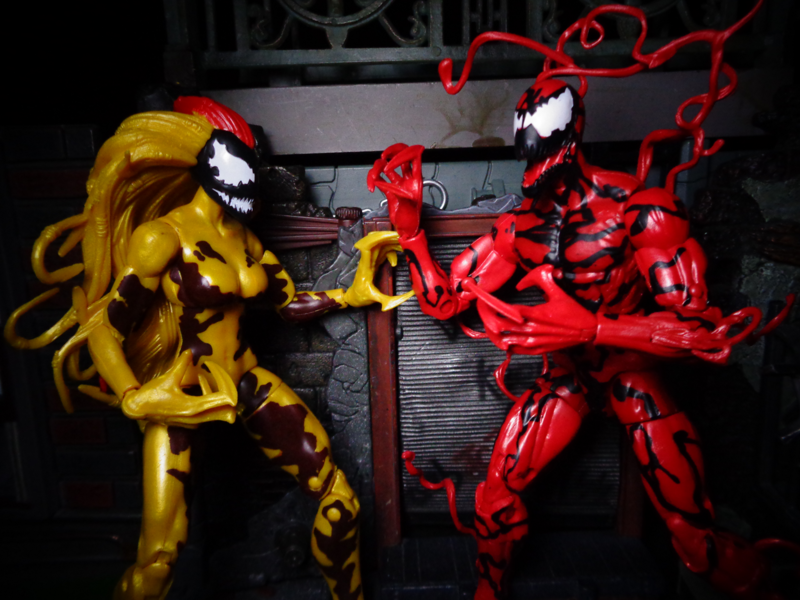 The new hands certainly add more play value to the figure, even if they do make photography more difficult! 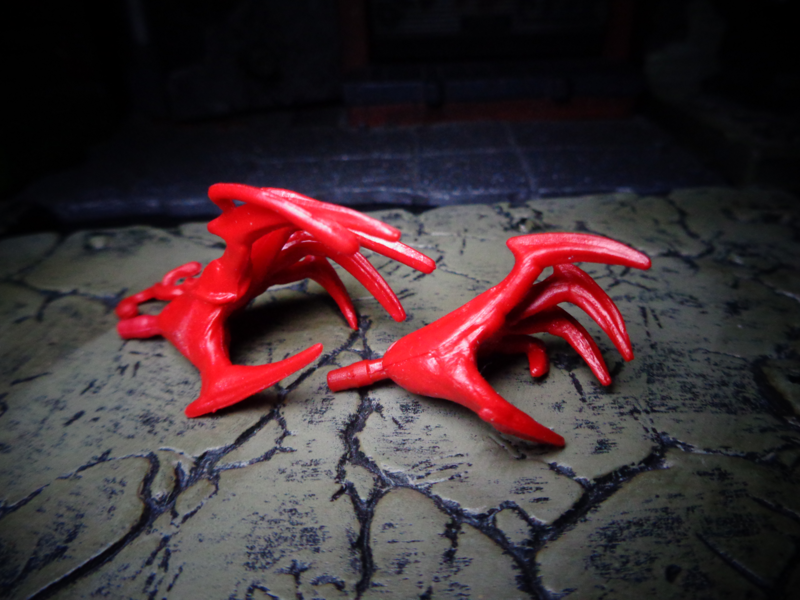 Perhaps some future releases could include other blade hands, too! 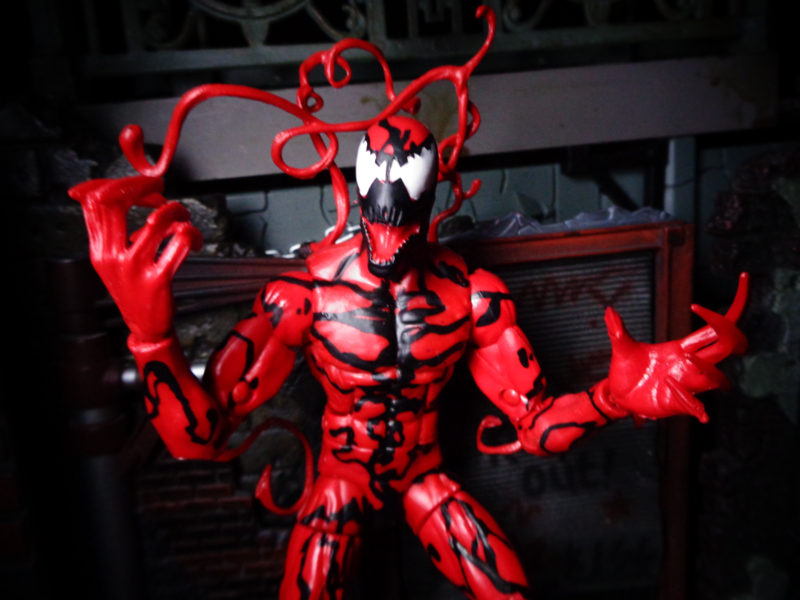 It is funny how the hands that seem oversized on Scream are perfect on Carnage. 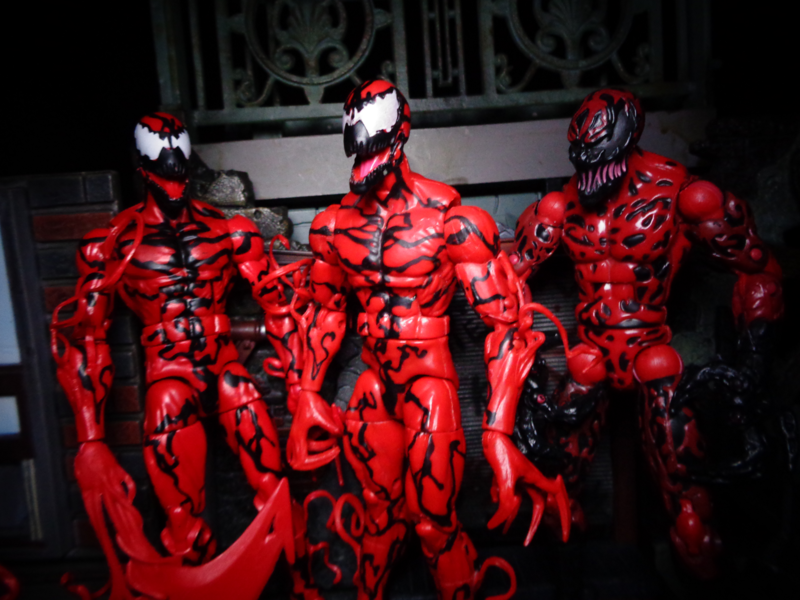 And frankly, it’s no wonder they redid this figure, considering that previous attempts haven’t been remotely as good. Well, there you go! 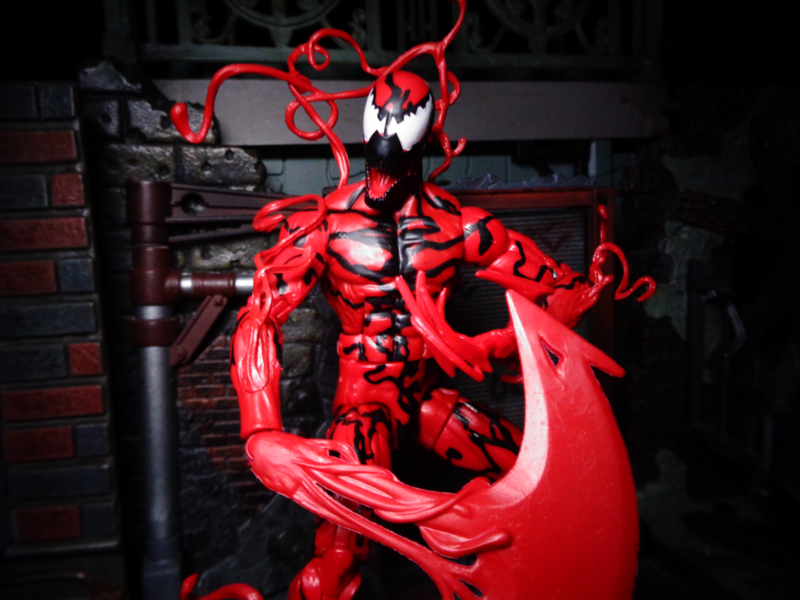 Technically it’s not a new figure, but if you’ve missed any other incarnation of Carnage, the extras make this your best bet so far!